WordPress mobile app for iOS and Android provides a very convenient way to manage the WordPress site on the go. It allows webmasters or bloggers to create and edit posts and pages, moderate comments, upload media and view the stats (if enabled in Jetpack). Sorry, we can’t log you in. Unable to find a WordPress site at that URL. Tap ‘Need Help?’ to view the FAQ. The WordPress mobile app communicates with the blog or site via XML-RPC service (e.g. https://techjourney.net/xmlrpc.php). If the WordPress mobile app cannot reach and access this PHP script, or XML-RPC requests are blocked, either by firewall or other external factors causing the requests to timeout. Replace yourdomain.com with your actual domain name. It should show “XML-RPC server accepts POST requests only.” if the access is granted. 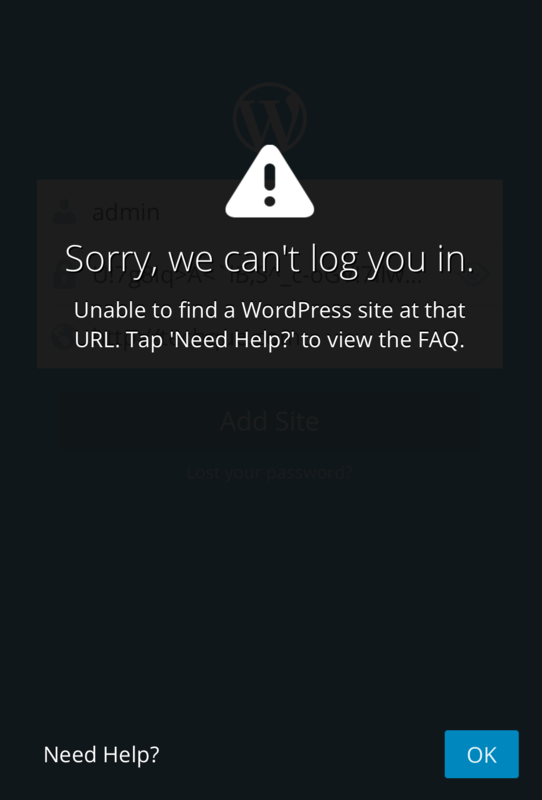 Thus, to access WordPress self-hosted site via WordPress mobile apps, fix the cause of inaccessible XML-RPC service. One possible cause is that the WordPress Address (URL) is different from Site Address (URL) in WordPress’ settings. WordPress supports installation of WordPress core files and directories in its own sub-directory, but have the website served from the website root. The purpose is to prevent WordPress files from cluttering up the root directory. For example, the WordPress is installed in “/cms” directory, but visitors continue to visit “/” root for the website. Another possible reason is that you’re using 2FA (two-factor authentication) solution for your WordPress blog, such as Authy, Duo Security and Clef, which disables access to the blog via XML-RPC service. In this case, you must explicitly instruct the 2FA solution to enable the XML-RPC service for the external apps to work. Normally the plugin will have option to re-enable the API (or making the WordPress less secure).